I’ve been doing family things this last week and I’m completely behind on my posts. I went to Boston what was already almost two weeks ago to read at the Cambridge Public Library (a story or two there but I’ll get to that later this week) and visit some bookstores and fencing salles. Then of course there was Thanksgiving. 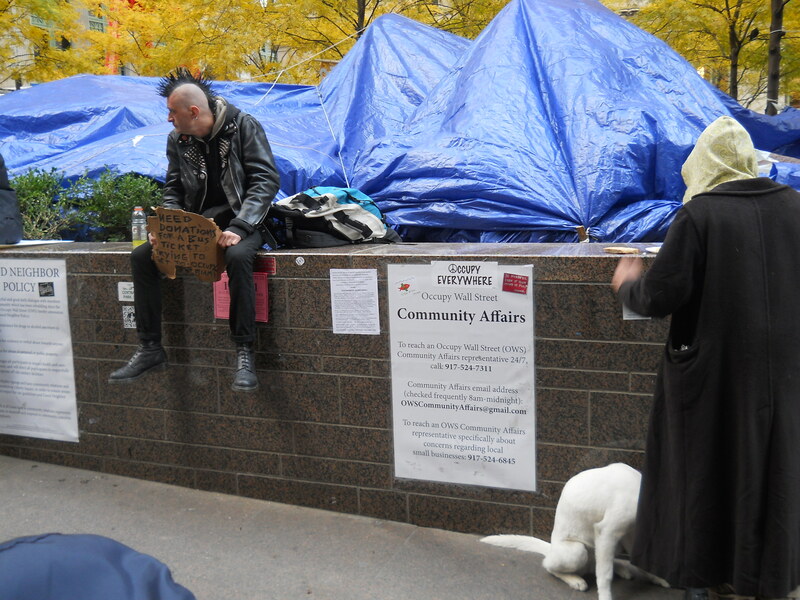 And my son finished his video of occupy wall street (to come later this week also). And I’ve been reading, in the planning phase for my next book. I just finished Six Weeks, by John Lewis-Stemple and I reread A Storm in Flanders by Winston Groom (the man who wrote Forest Gump). I’m writing little pieces in Scrivener, creating the world bit by bit. A very different process for me than Open Wounds. But then, things change, writing process, life, many things. I’m in that kind of mood. So I was listening to a lot of car radio, NPR to be exact. I love the talk shows when I drive. I heard Fran Drescher being interviewed last week and couldn’t help myself from frantically scribbling down what she said because I thought it so appropriate to writers. Now I should give this context. She was talking about her Cancer Schmancer movement. I heard it speak to me as a writer. Andrew Smith’s blog addressed this not too long ago and I thought what he said and the comments posted from that day to be very deeply felt and true. I think that so many of us write because it is healing and there is pain to heal. But does that mean you need to have had a crappy life filled with sorrow in order to find the right notes in your work? I don’t think so, but then on the other hand if you want to write deep work it helps to have been there. I think it depends on what you want to write. I remember some Frank Sinatra bio (hey… I like Fran Sinatra’s voice – he’s got a great voice – so cut me some slack) I saw on TV a long long time ago. I don’t remember the name of the film or the stars but I do remember one scene in the movie early on when he’s just starting to sing. He’s told by a nightclub owner that he has a great voice but that it has no feeling to it. The man says, go on out and live some and then come back when you can understand what the words mean. It made an impression on me. As someone who has lived long enough to have had my share of loss (the longer you life the more you experience – that’s just the way it works) and probably a few extra thrown in just to make my life more interesting, I can say I didn’t write the hard stuff well, until life had happened. My understanding of my character’s pain deepened and my ability to write about it got better. This has been my process. Would I choose an easier one if I could? This entry was posted on November 28, 2011 by Joe Lunievicz. It was filed under Andrew Smith, Blog, Fran Drescher, Next Book, Occupy Wall Street, On Writing . I think it makes perfect sense. Joy would have no meaning without suffering to define it. If there was no such thing as shadow, light would not be very bright. That being said, I don’t think you have to be an ex convict or a dope-fiend to write about those things, if you have true imagination, but it helps. I remember that post of Andrew’s, too. I think about wounds every day as I teach. For so many kids there are things going on and it is an act of courage each day to get out of bed and get out of the house and make it to school. For me, I can’t say, exactly, that I am grateful for my wounds. I know that my DNA is changed, and change at a cellular level can be denied but that has consequences. I don’t know if I would change events if I could, because that would be like changing something essential about me, some–is it grace?–that holds me steady in my core. I think about that alot also. Yogis call it a deeper wisdom but grace is a word that resonates just fine with me. I would not be me without the wounds that have shaped me. Would I rather have my friends/brother back? Yes. But that way lies madness as they say because unless you’re in a paralell universe the world around us is the world we have. Great sorrow. Great joy, yes. I don’t know if this is spam or not. If it’s not then write back and I’ll be glad to give some tips.